OPINION: Here's What SGA Did D..
What We Learned from 1 Year of..
Amidst marches happening around the country, Women’s March Chicago did not participate in hosting the annual January march. In its creation,Women’s March Chicago formed with all other groups back in 2017 with the first march right after President Trump’s inauguration. Women’s March DePaul, is a chapter partner of Women’s March Chicago, and we encourage our members to get out and take part in Operation Activation. As president of the group, I and my team made sure that our group was heavily involved in getting people to the October’s March to the Polls, and since not tied to the national organization, did not work on efforts to march. The group will be working on other efforts to continue the activation step. We will continue to work alongside Women’s March Chicago for 2020 planning, and other events throughout the year. They also have events of their own planned, such as a period drive for Cook County Jails. Just like Women’s March Chicago it’s about getting out there and making a difference, even if it is a small action. Women’s March Chicago held a large March to the Polls event in October to get people out to vote in time for the midterms. This was their motion, instead of waiting until the annual January march to make a push for change, they felt they needed to get their action out right away, because the midterms couldn’t wait. From the announcement of their October event, they had been clear about not wanting to host a march the following January. It costs about “$150,000 to host a march and it would be almost impossible to fundraise all that in time,”according to Kurensky. “We named our second march in January of 2018, March to the Polls. After that march, a lot of those who identify as women and their allies were galvanized to get out the vote and some to run for office. We wanted to continue that momentum,” Kurensky added. Women’s March Chicago and a few others across the nation made the decision that many did not, to go their own way and not partner with the national organization. They are a local nonprofit focused on their own initiatives, and seek to improve the Chicago community, they do not partner on the goals and events National has put out. Kurensky describes how “many of these branches started out of living rooms and coffee shops.” Women’s March Chicago being no different. After hosting the 2017 march they decided to go along their own path. Amid much controversy of the national branch and their connection with Nation of Islam leader, Louis Farrakhan and his comments of anti-semitism, there have been calls for the leaders to step down. Women’s March Chicago is not connected to this branch nor Farrakhan, they released a statement earlier in the fall stating their stance against the matter, and their distance from it. They wanted to commemorate the third anniversary of their group, but the march was not their way to do it. Operation Activation, was created to get members of their Chicago community out to do whatever action would make the world a little bit better. There was an initiative backed by Women’s March Illinois, a group backed by national. A rally in Federal Plaza, lead by a youth effort to raise their voice and empower their community. “There were a number of rallies and marches organized in the area. We were encouraging of all of them – Women’s March Chicago is part of the women’s march movement and certainly no one group or organization owns a movement,” said Kurensky. Though the two groups are not aligned, Women’s March Chicago supported their action, but did not work with them in the planning or formation of this rally. There are other chapters tied to national that held marches on the 19th in their hometowns as well. “In order to reach our goals we move forward, putting one foot in front of another. That’s really what marching is. On January 19th many of us were marching, just marching differently,” said Kruensky. The group wants to continue activation throughout the year and gear up for their next big event. 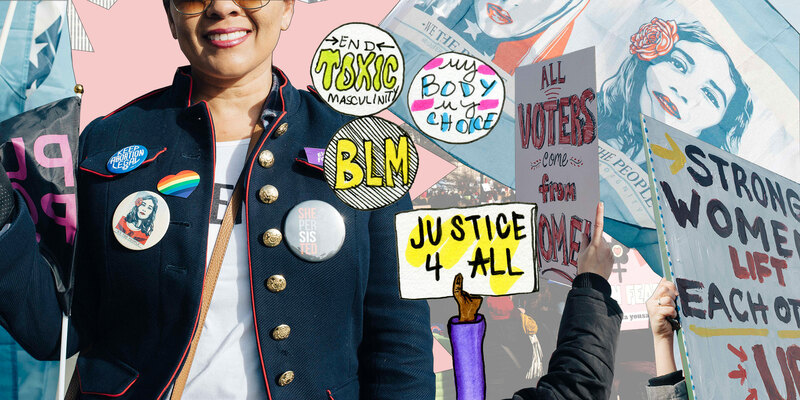 Women’s March Chicago has plans for a major march in 2020, and have already begun preparations. Details will be released as they become available. Header image by Jenni Holtz and Natalie Wade, 14 East.